Recently, a friend dropped off a lot of old cycling magazines – from an era when cycling magazines had long articles and lots of timetrial times. Beautiful. I don’t know why I like flicking through times from a 25 mile TT in the 1980s, but I kind of do, I guess that’s why I ended up timetrialling. 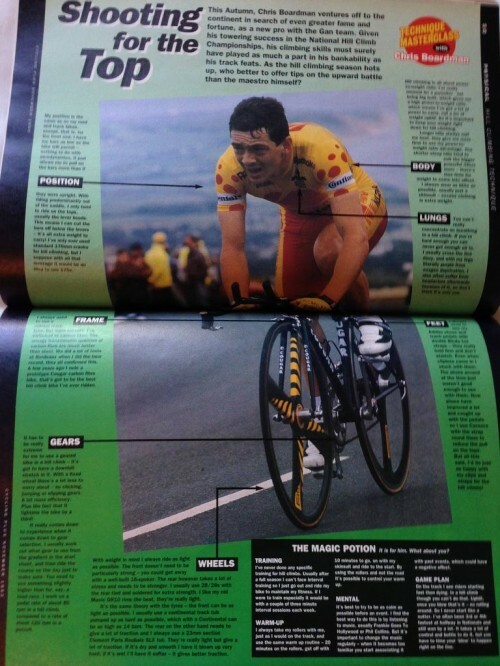 One magazine had a special feature of Chris Boardman on hill climbs tips. 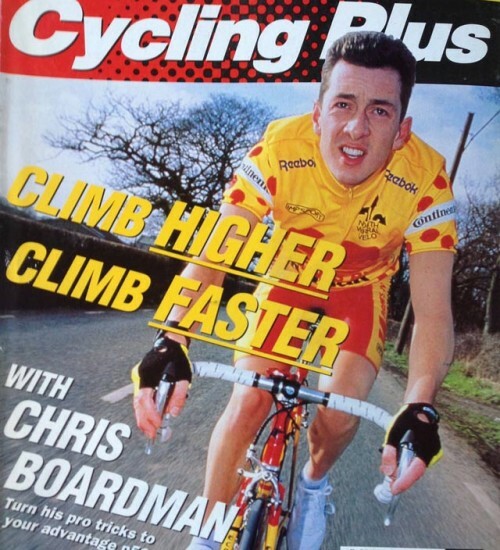 This was earlier in his career when Boardman was still a domestic UK rider and three times hill climb champion (1989-91). This was of interest because if anyone knew some good hill climb tips, Boardman would be one of the first I asked. With this in mind, it was inevitably a bit of a disappointment, when I see Boardman’s answer was that he didn’t do any intervals for the hill climb season. He just rode his bike a bit to try and maintain form from a long road season. Don’t you just hate it when people rely on natural talent! Three times national hill climb champion and not even a single hill climb interval to speak of! Well maybe a few were sneaked in there somewhere. It was a bit disappointing, but in a way makes sense. A big thing of hill climbs is being fresh for the big event. I read somewhere Dan Fleeman stated his preparation for 2009 Nat Champs on Pea Royd Lane was sitting on the sofa for a week, recovering from the 250km + Tour of Lombardy the previous week. Boardman said he always rode fixed for hill climbs. Unless it was a hill with substantial downhill, a fixed would be quicker, because it was at least a third lighter. Unfortunately, this does shows the age of the magazine a bit. These days bikes are so light that you can get a geared bike for a not too dissimilar weight that fixed gear bikes used to weigh. Nowadays it is a diminishing band of traditionalists who continue to ride fixed in hill climbs. It’s always great to see fixed being ridden, I’ve just not got round to doing it myself. I’ve ‘ummed and ‘arred about buying a fixed bike for several years – the heart says buy, but mind says no; I don’t think I will ever buy now. There’s always a new bike to buy, but even I struggle to splash out on a new bike which only might get used for a few minutes each season. Boardman definitely had the ability to go really deep. His tip was to warm up on rollers, perhaps listening to music, but always make sure you use a different piece of music each time. Otherwise a favourite track may get indelibly associated with a particularly painful hill climb effort. Front wheel doesn’t need to be particularly strong, so go as light as possible. Rear wheel takes quite a battering so needs to be stronger. Cut off the drops of the handlebars because you will probably be riding on the hoods. Never start like a nutter – Boardman often won championships where he was slower at the half way point. Only in the last half would he really go into the red. It takes a lot of discipline to hold back until the right moment and then really go for it.